Steel strapping is heavy duty and secure, making it ideal for securing heavy consignments with sharp angles. 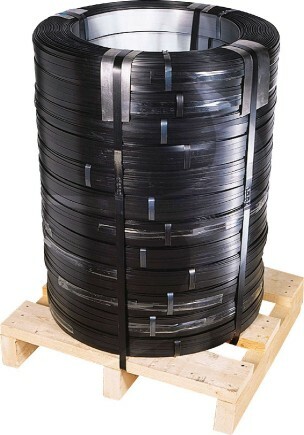 The steel strapping conforms to sharp angles and awkward shapes alike, meaning that this strapping is ideal for securing, storing and sending any irregular consignments. Ribbon wound steel strapping coils contain less strapping than our oscillation wound steel strapping coils and are also lighter, making them ideal for the lighter duty user. The edges of the strapping are sheared and dressed for added safety. This steel strapping has been designed with safety in mind. Use our range of steel strapping tools to create a secure seal and cut with one of our safety cutters to prevent the steel strapping from springing back when cut.